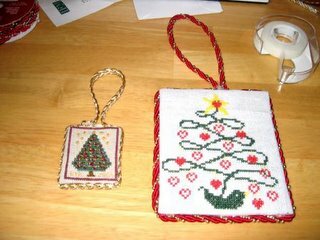 Here is a pic of my last two ornaments for this year. I think they turned out cute! I also took pics of the wedding sampler, but right now blogger won’t upload it. Just one more thing that won’t go my way tonight. I also can’t get the stupid piece to stay centered while I frame it. Hopefully Allen will have better luck when he get home!! Tomorrow we head up to MD to visit my parents for the weekend. Tomorrow night will be our traditional Christmas Eve dinner with our extended family, minus my sister this year. Then on Christmas Day, Becca comes back from visiting her fiance’s family and we are going to see King Kong before going to my Aunt Leslie’s to celebrate the first night of Hannukah. Should be a fun weekend!! Hope everyone has a wonderful, safe and relaxing holiday weekend!!! Those ornies are so cute! You did a great job! They’re beautiful! Have a safe trip and a very merry Christmas!